REFLUX REALITY: A Guide for Families was written by Glenda Blanch in association with RISA Inc after it became obvious there was a real need in the community for more readily available, accurate information on gastro-oesophageal reflux and its management. The book represents a collaborative effort by the author on behalf of the Australian and international medical communities and the Reflux Infants Support Association Inc to create a comprehensive resource for families to manage this extremely difficult disease in children. The extensive list of highly qualified and experienced contributors and reviewers is available here. Parent’s testimonials about the book. It is THE essential book for any family with a baby or child who suffers from gastro-oesophageal reflux. It offers information on reflux and management strategies, and a stack of practical advice for dealing with babies and children of all ages. It includes important issues on sleeping and feeding that have been addressed by specialists in their fields, as well as personal experiences and stories from reflux families. There is also a section designed specifically for family and friends to read. This book has been thoroughly researched and reviewed by leading practitioners across Australia and internationally. It is easy for parents to lose confidence in themselves and their parenting abilities when they have a child who suffers from gastro-oesophageal reflux. 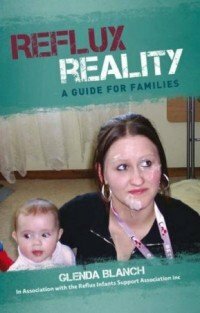 Reflux Reality: A Guide for Families aims to help parents feel in control and better able to cope. And importantly, it is the only up-to-date book on gastro-oesophageal reflux that is written for Australian families. We know that caring for a child with reflux can be time consuming and sometimes all encompassing, so the book has been designed to be read from front to back, or section-by-section, in any order. It can be picked up and put down whenever there is time. Coping tips… and much more offering support and understanding to those affected. Reflux Reality: A Guide for Families provides more information on those topics that are most important to your particular case. Our website can only hold so much information without becoming overwhelming. That’s where the book comes in. Buy it directly from RISA for $25 + postage by clicking on the button below or by emailing [email protected]. Please note, additional charges will be incurred for international shipping. Several copies are available to borrow from the RISA Library.